This week’s Simon Says Stamp’s Wednesday Challenge has inspired me to get very puny. 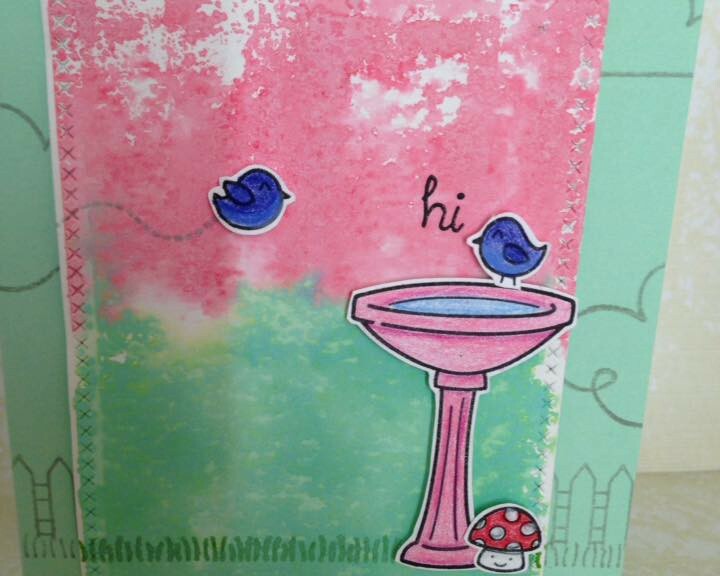 Extra Details: I began this card with a panel of water color paper. 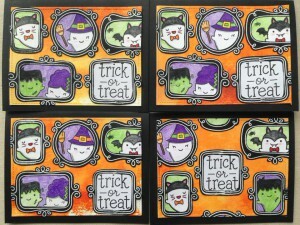 I stamped and clear embossed the sentiment and images on the panel. 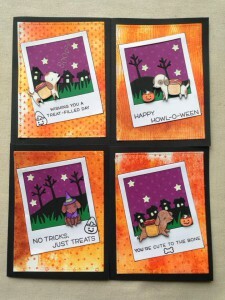 I created the sentiment using a few different stamp sets. I water colored everything with Crayola Fine Line Markers. I used the same markers to water color the background. 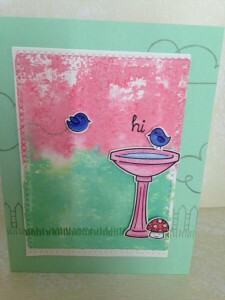 Once everything was dry, I stamped the bubbles in Lawn Fawn’s Merman ink. Then I adhered the panel to a dark blue card base and the card was complete. 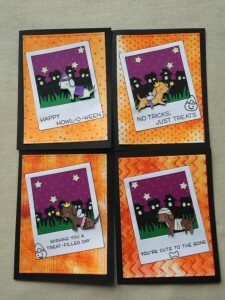 This week’s Simon Says Stamp Monday Challenge is to make an Artist Trading Card. The only rules are the card must be 2.5 X 3.5.” Our stay at the lake this summer inspired me to make this mini scene. Extra Details: I began with a 2.5 x 3.5 inch rectangle of water color paper. I lightly drew a wiggly line in pencil. This would be where the beach and water would meet. Then I ink blended some Brushed Corduroy Distress Ink on the beach area. I used Cracked Pistachio and Salty Ocean Distress Inks for the water area. 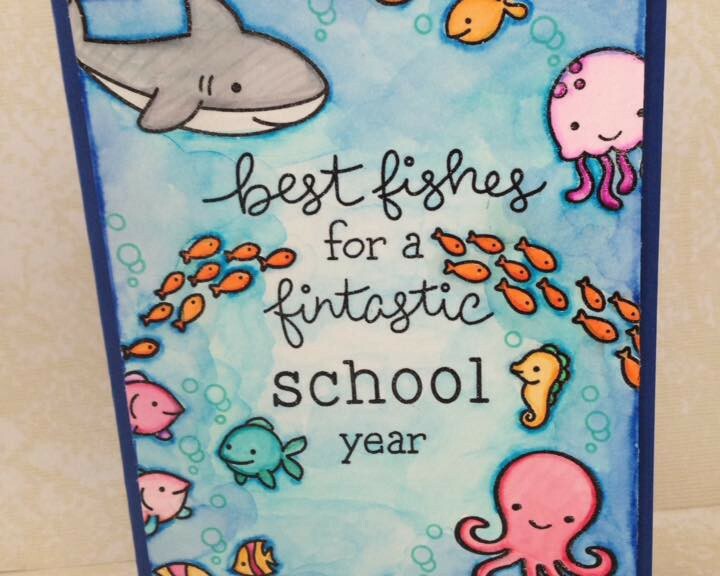 I used the same inks and second generation stamping to add the heart, “stones”, and waves. I used some white pigment ink to add some waves. I used the same ink and a stiff paint brush to add the surf where the water and beach meet. 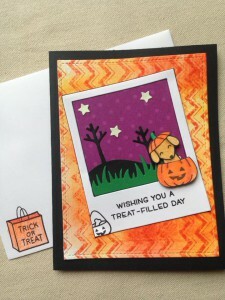 I LOVE this and will be making a larger card using the same design sometime soon. I decided it was time to clean out a few of my scraps of patterned papers again. 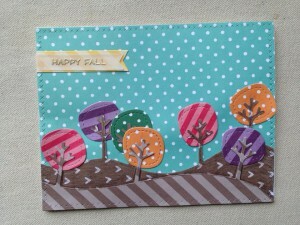 Now that fall is almost here, I’m in the mood to make fall themed cards. Today, I made 10 cards with the same basic design. 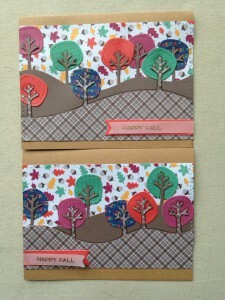 I also used up quite a lot of my Lawn Fawn patterned paper scraps. 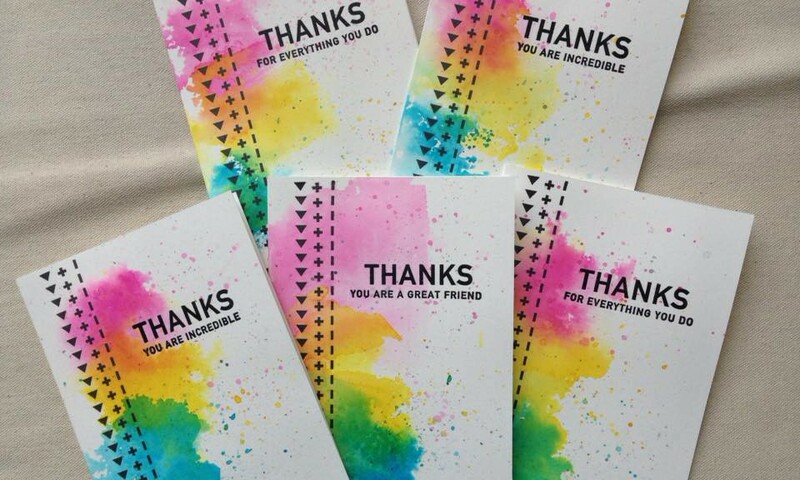 I love how even though each card is the same design, they all look so different based on which paper collection I choose to use. Close up of Water Color trees: I had some left over water color paper from the Halloween Dog Card sets that I couldn’t let go to waste. So I pared it with plain card stock to create these cards. 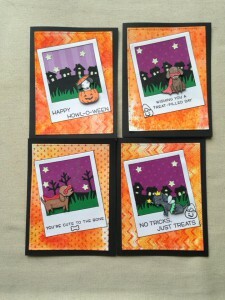 Extra Details: I began all of these cards by die cutting some large cross stitched rectangles. I chose blue papers for the sky. 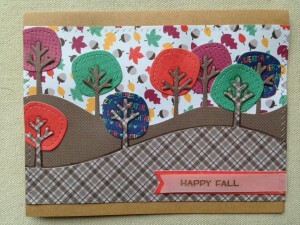 I did not have a blue from the Sweater Weather Collection, so I choose the leaf and acorn paper instead. I only had one sheet of the Sweater Weather paper and the Perfectly Plaid paper, so I cut them in half so I could have two cards. I used browns or greens to cut the trees. I made two tree hillsides form each cross stitched rectangle. 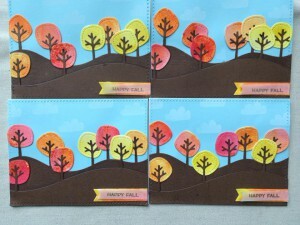 Then I used a variety of papers to create the leafy parts of the trees. I also cut out some banners form the patterned papers. Then, I began assembling the cards. 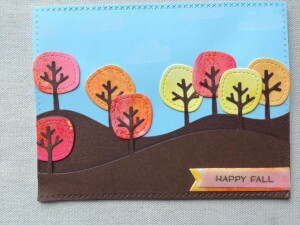 I adhered the tree hillside to the sky pieces. Then, I added in the leafy parts with liquid glue. 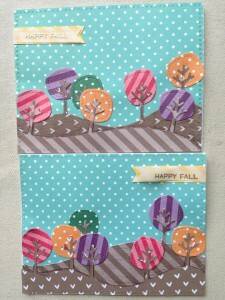 The Sweater Weather and Perfectly Plaid scenes ended up slightly smaller because I had cut the sky paper in half. I used colored pencils to add some color to the hill in background. I am glad I did this; it helped to add some contrast between the hill layers. I adhered the scenes to card bases using strong double sided tape. 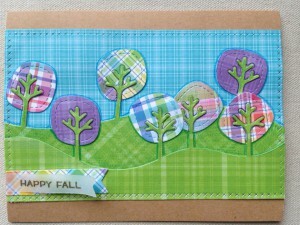 The Sweater Weather and Perfectly Plaid scenes were added to kraft card bases. I used white card bases for everything else. I had some trouble with the sentiments. I wanted to use the tiny Hello Fall from Ready Set Shake. However, it got lost on the patterned papers. So I cut smaller banners from velum and gold embossed the sentiment on them. 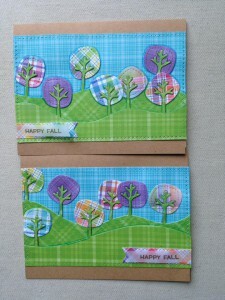 I layered the velum on the patterned banners and then adhered them to the cards. 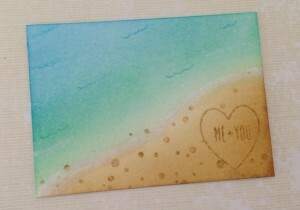 At the very end, I added some white clouds to the water color cards. 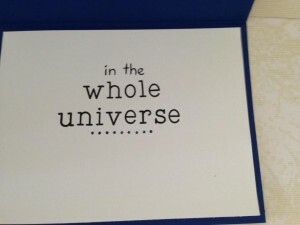 I felt the sky section on those cards were just too plain. I love how these all turned out and I cannot wait to mail them out. I was just having fun playing with the two colors of Distress Oxide ink that I own. 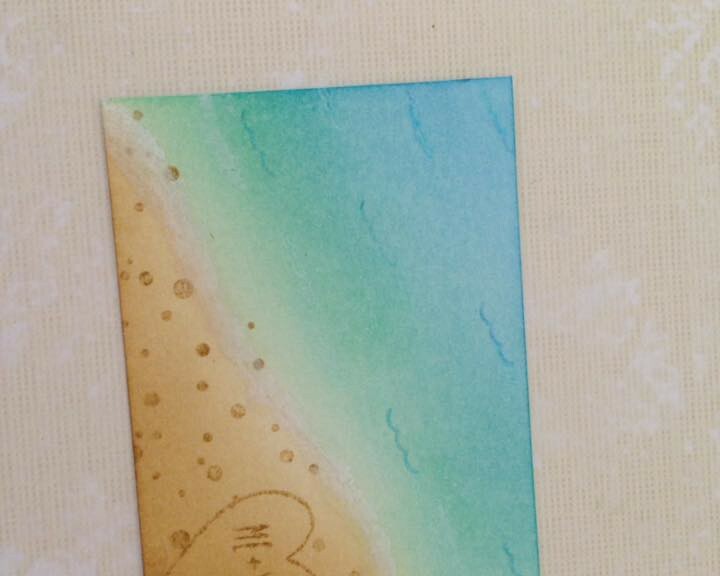 Extra Details: I began this card with a panel of water color paper. I ink smooshed the Worn Lipstick and Cracked Pistachio Oxide inks on the panel. I let the ink and acrylic block sit for about five minutes before letting it completely air dry. While the panel was air drying, I stamped colored and fussy cut the images from Gnome Sweet Gnome on a scrap of white card stock. I left a small white border around the images. Once the panel was dry, I stamped the grass line in the same oxide ink and the sentiment in black ink. Then, I adhered the images to it with foam tape. I created a card base from mint colored card stock. I added the grass and some clouds with a grey ink. 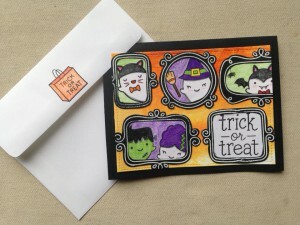 Then, I adhered the panel and the card was finished. I had quite a few flowers left over from the Fib Hello card. So I used them to create this card. 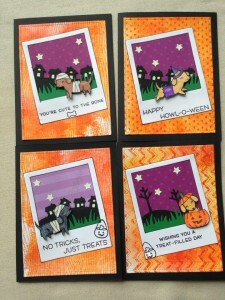 I also created my own sentiment based on the Simon Says Stamp Encouraging Animals Stamp set. 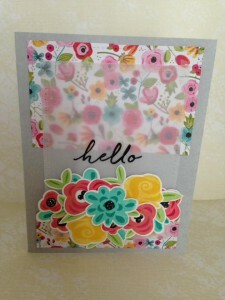 Extra Details: I started this card with the stamped flowers and leaves that were left over from another project. I also found a grey frame from yet another project. I created a yellow card base. Add the frame and flowers. I decided on the sentiment and added that with an alpha stamp set. 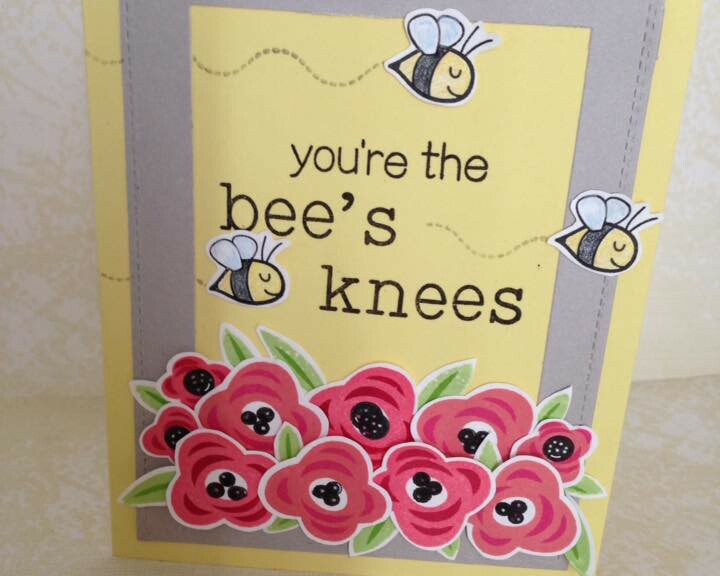 Lastly, I stamped and colored the bees on a scrap of white card stock. I fussy cut them out. 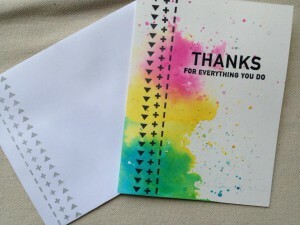 I adhered those around the sentiment and added the dotted trail with a light grey ink. I have been staring at this Illustrated Faith paper that was included in the April Simon Says Card Kit since it arrived in the mail. It was so pretty; I was having a hard time cutting into it. I finally used it today. 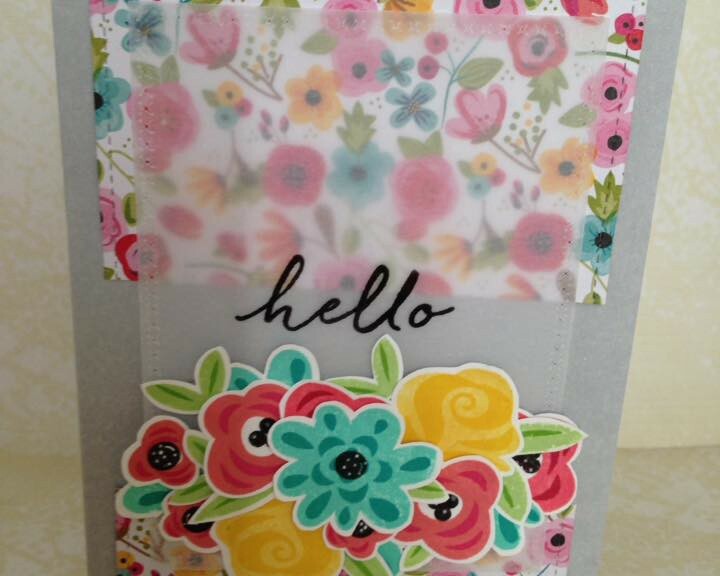 Extra Details: I began this card by stamping the flowers on scrap of white card stock. 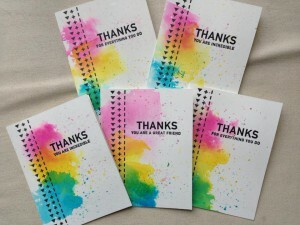 I tried to use ink colors that matched the patterned paper. 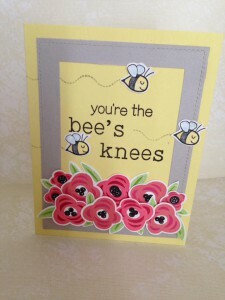 I added some black stamping to the centers of the flowers to help it matched the patterned paper more. I fussy cut everything out, leaving a small white border. 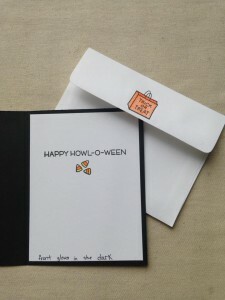 I created a grey card base and adhered the patterned paper to the front. 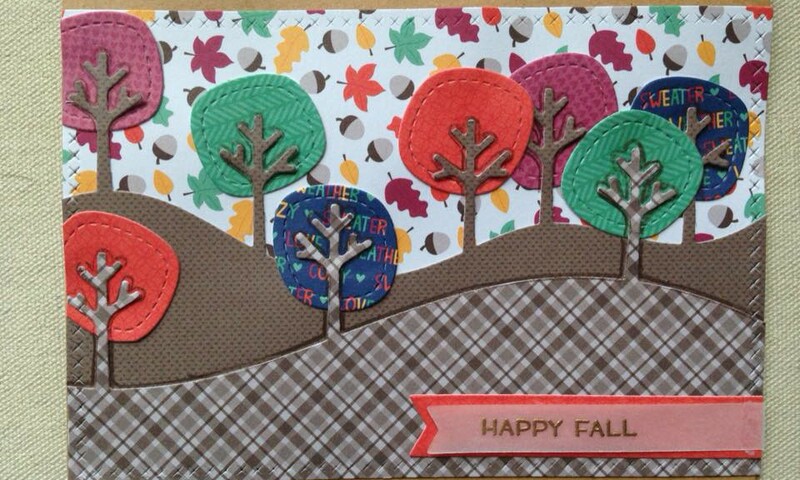 I wanted to leave an open space for my sentiment, so I trimmed the patterned paper in create a grey rectangle. I added a small rectangle of velum next, to help my sentiment and flowers stand out. I stamped the sentiment on the velum and then began layering my flowers. I used small glue dots and dimensional glue dots to adhere the flowers. I’m still not completely happy with my arrangement, but I do like the card overall. I just love the little monsters from Monster Mash as aliens. 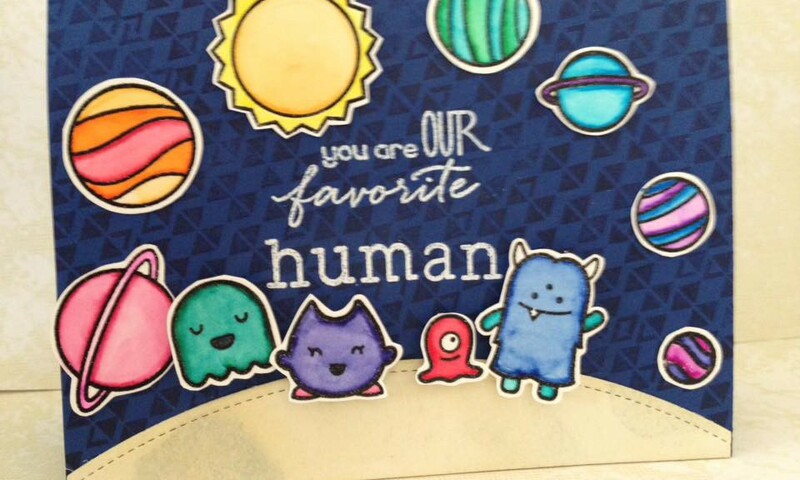 I used a number of stamp sets to create the sentiment. 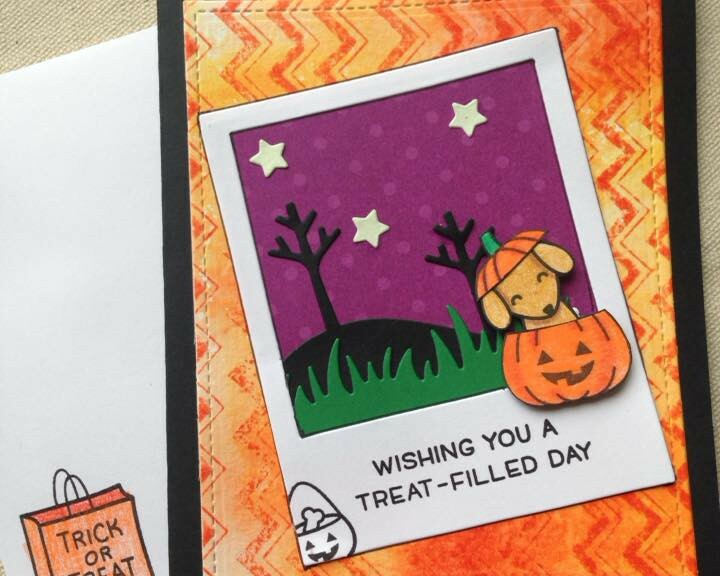 Extra Details: I began this card by stamping and clear heat embossing all of the images. 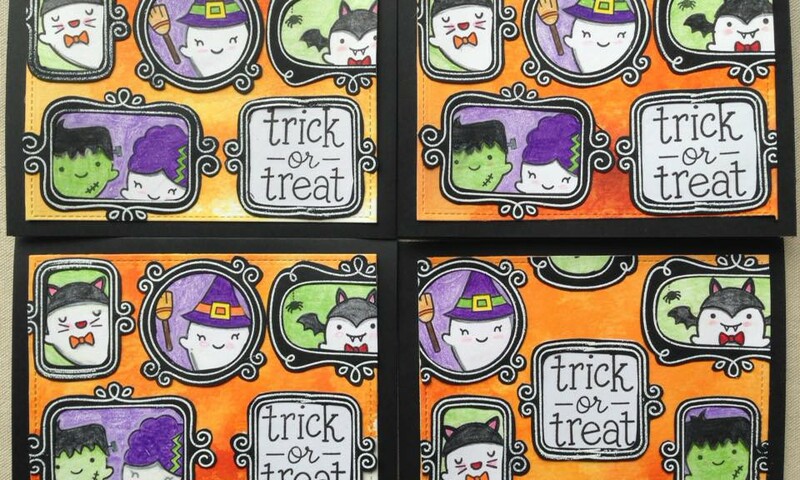 I used Crayola Fine Line markers and a paint brush to water color each of the images in. Once dry, I fussy cut them out leaving a small white border. I die cut a Stitched Hillside from some water color paper and used Distress Inks to create a moon type landscape for my monsters to stand on. Next, I created a dark blue card base. 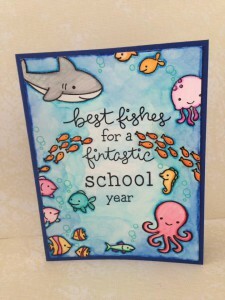 I used a background stamp and some navy ink to add texture to the card front. 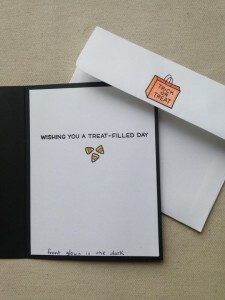 I white heat embossed the sentiment in the center of the card. 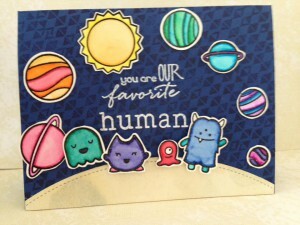 I added the monsters with foam tape and adhered the planets flat to the card base. 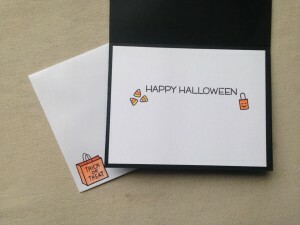 Because I used some a dark card base, I added a white liner to the inside of the card. I finished my custom sentiment and added a line of small stars.